You can debug Meteor server code using the --inspect flag in Chrome DevTools and within integrated developer environments like Visual Studio Code (VS Code), a free code editor, and WebStorm by JetBrains. Before we get started, make sure you have at least Reaction 1.6. If your Reaction version is older than 1.6, you will have to upgrade to at least 1.6 first. After that, the application will run, just like running reaction. INFO Reaction: Reaction initialization finished. Now, you're ready to debug! Open Google Chrome and visit chrome://inspect. Click Open dedicated DevTools for Node. There are two main ways to set up breakpoints: in the DevTools or in the code. To set up a breakpoint in DevTools, open up the Source tab and navigate to a file you would like to debug in the left-side bar. Click on the line number where you'd like the code to stop executing. You can set up as many breakpoints as you'd like. To set up a breakpoint in your code, add the keyword debugger right before you'd like the application to pause execution. Remember: Since you are currently debugging the Reaction server, you'll only have access to code that runs on the server - not the client. Now open http://localhost:3000 as you normally would and the code should stop executing at your first breakpoint. At this breakpoint, you can access the Console by hitting esc and opening the Drawer. Now you can watch variables, check the call stack and investigate scope to better debug while you develop. To learn more about Chrome DevTools, check out Google's Tools for Web Developers. Note: You can only have one debugger connected at a time, so if you've already connected to DevTools, then you'll need to disconnect before you can connect with VS Code. Setting up VS Code and connecting it to the Node debugger is only slightly more complicated than using DevTools. But once it's set up, it can easily become a part of your regular workflow. In the root of your project directory, add a .vscode/launch.json file. This borrows heavily from a Meteor forum post on Meteor 1.6 server debugging with VS Code. Tip: Port 9229 is the default Node inspector port, but if you switch to another one, eg. --inspect=5000, then you'll need to adjust the port in your launch.json file. Now you can debug without even leaving your code editor. Create a new Run/Debug configuration based on the Meteor default. Select your breakpoints by clicking along the left-hand side line numbers. Click on the Debug icon to start you Reaction app in debugger mode. Use the Step In, Step Out, Steop Over buttons to navigate through the code. 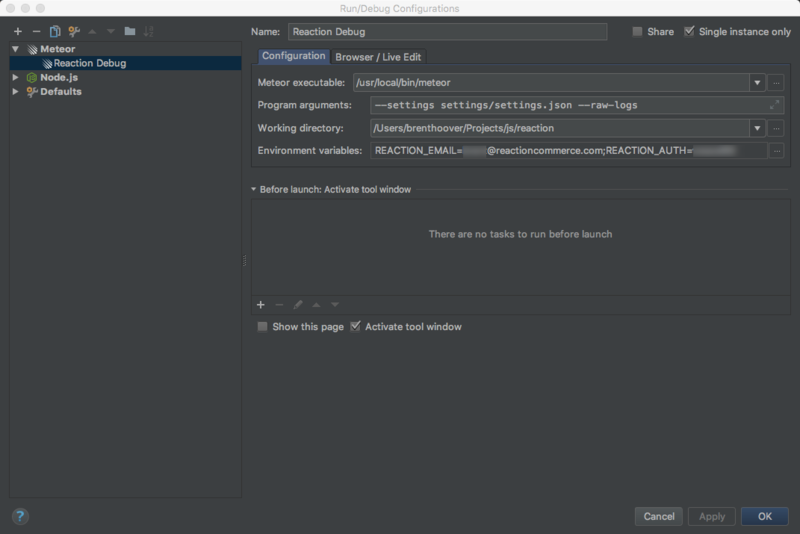 For more on debugging with Webstorm, check out the Jetbrains guide.